In Rotterdam, Frame Vastgoed has a unique project in development: the Rijnhaven District. With the arrival of various designer shops, exclusive catering, a renovated Jumbo supermarket and a renowned five-star hotel with rooftop bar, this area will become a new place to be with international appeal. 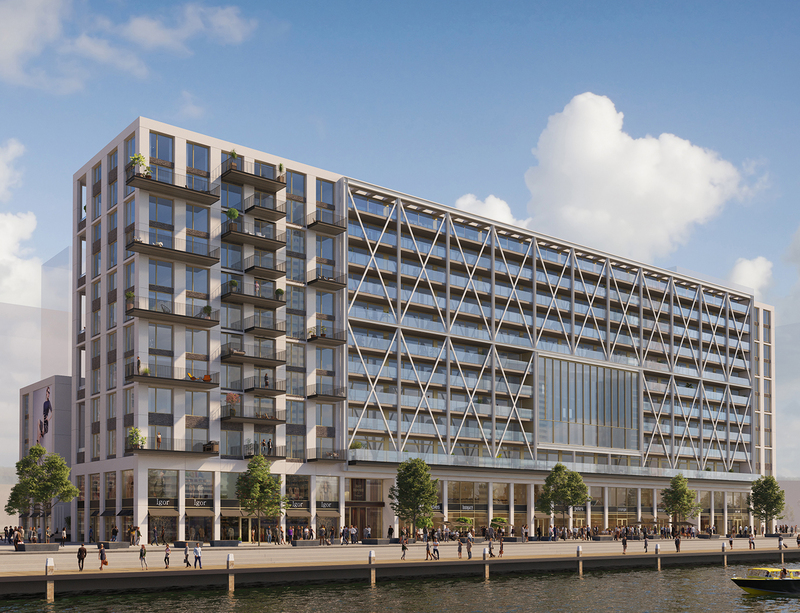 The luxury apartment complex Bay House will be part of this groundbreaking Rijnhaven District. We are proud of Frame Vastgoed's invitation to be one of the three proposed interior designers to work on this special residential project. Bay House offers approximately 88 owner-occupied apartments with surface sizes ranging from approximately 80 m2 to 350 m2. The total number of owner-occupied apartments can vary: there is the possibility of linking several units together. This makes extra generous floor space possible and also a large freedom of choice of layout. The apartments on the second floor have an exceptional ceiling height of 3.36 metres. All apartments are standard available in Rough; Rough is comparable to a hull delivery: together with Design Unlimited it is free to make your own layout. Together with you we make a specific interior design and we arrange the completion of your apartment. Most of the apartments are optionally available as a Signature, i.e. built to one of the existing designs. Madelon can then also create a personal interior. They are the 'top of the bill' of Bay House, the superlative in living pleasure, the Royal Penthouses. And there are only four, no two of which are the same. Even those who place the highest demands on their living comfort are overwhelmed here. If it's not because of the excess of space, it's because of the impressive view that the many glass and outdoor space offer. Here you experience the skyline of Rotterdam at its best, indeed, you are part of it. A Royal Penthouse in Bay House gives you the chance, perhaps the once in a lifetime opportunity, to create your dream loft. Design Unlimited has created a layout for these apartments with a separate residence (for the nanny or caregiver) with facilities and private entrance. Also very suitable for use as a studio or office. The Town Residences are the only Bay House houses that lie directly on the courtyard garden instead of on the Rijnhaven. Another special feature is that there are only three of them. Yet that is not the only thing that makes these apartments special. It is also the location on the corner with an orientation to the southwest that gives these apartments their very own living quality. Because this means lots of light, space and views of the green benefits that the roof garden offers. The three Town Residences each have different outdoor spaces. The upper apartment has a patio, the middle one has cantilevered balconies and the lower apartment has, among other things, an outdoor space adjacent to the roof garden.